The US$1.1 billion Juno mission hit a huge milestone Monday night when it successfully entered Jupiter's orbit. But what will happen to it in February 2018 when its job is done? Spacecraft don't really get happy retirements. Sure, there are a few space shuttles resting on their laurels in museums, but that's because they brought people home. Some unmanned probes do make it back to Earth if part of their mission is to bring back a sample, like Hayabusa, a Japanese spacecraft that visited an asteroid. Juno won't get that kind of treatment. In fact, its fate is much grimmer. After its final trip around Jupiter, it will enter what NASA euphemistically calls its "deorbit phase". That's a tactful way of saying Juno will spend the last five and a half days of its existence hurling itself into Jupiter. The planet's atmosphere is so harsh the spacecraft will burn up. 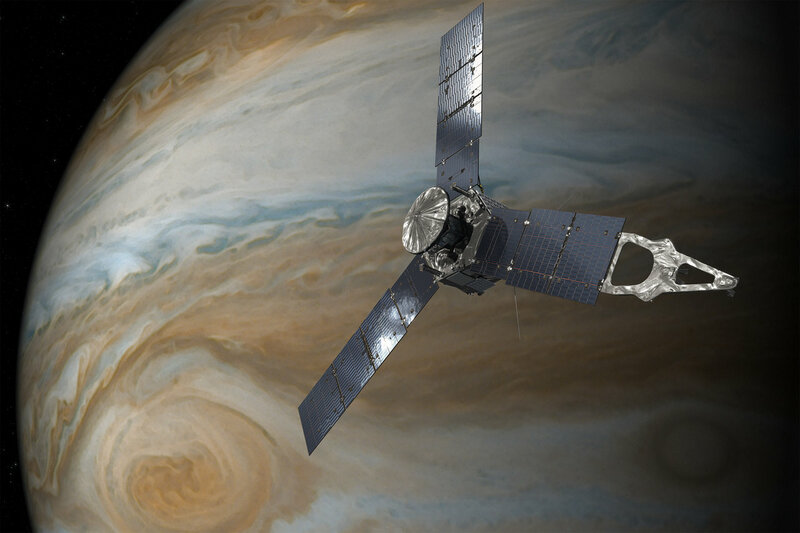 It's the same fate that met Juno's predecessor on the trip to Jupiter, Galileo, in 2003. But why fling a $1.1 billion satellite into an extraordinarily large ball of burning gas? For the (potential) aliens, that's why! Scientists currently think one of our best shots at finding living organisms beyond Earth is on Europa, one of Jupiter's moons that might have an ocean hiding underneath its frozen surface. NASA is currently working on figuring out how to send a lander to Europa to get a better handle on whether there's any life to be seen there. Two other Jovian moons, Ganymede and Callisto, are also on the list of contenders. Throwing Juno into Jupiter protects Jupiter's moons from contamination since the trip through Jupiter's atmosphere and radiation will destroy any bacteria that may have snuck onto Juno before it launched. The planetary protection protocols are also why spacecraft are assembled in clean rooms by people wearing protective gear. And as we learn more about the worlds around us, those rules change. Galileo's death plunge was actually a change of plan, prompted when NASA got the first hints that Jupiter's moons could actually be hospitable to life. The dramatic death also keeps Juno from adding to our huge space junk problem.